Pro Tools HDX is Avid’s flagship DSP-based Digital Audio Workstation, the world’s standard DAW platform for the most demanding projects in music, film and post production. In a nutshell HDX offers up to 5 times the DSP power and 4 times longer delay compensation than the HD Accel card of the previous flagship system, Pro Tools HD. On many types of plug-ins, the speed advantage is even more significant because the modern DSP chips have way more RAM than the previous Motorola 56k chips that were used in HD Accel. Additionally, the built-in FPGA chip frees all 18 DSP chips per card for actual signal processing as the behind the scenes audio routing management is handled by the FPGA. This is also a massive enhancement from Pro Tools HD Accel which forced you to dedicate DSP chips for Pro Tools Mixer. 64ch audio I/O capacity per card is also doubled from previous HD Accel-generation. Combined with the speed advantages introduced in new Pro Tools Ultimate software – like disk cache which loads the whole session in RAM and realtime CPU-based fades – HDX coupled with a modern Mac with SSD boot drive and decent amount of RAM is an absolute speed monster. And thanks to DSP-based, dedicated processing, you never have to be afraid to overload the system with complex mixes, thus avoiding the inherent unreliability of systems based on CPU only. There’s no need to split the projects into “sister-sessions” just to avoid crashing the machine. 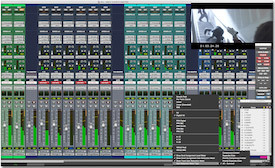 Maxed out at three HDX cards, Pro Tools HDX offers 786 simultaneous Voices (playable audio tracks, 256 per card) plus 512 instrument tracks, 512 MIDI tracks, 512 Aux tracks, and 64 video tracks. Unlimited busses rounds up the track galore of a system which basically enables a production of a Hollywood film in a box – coupled with a professional controller like S6 of course. There’s a reason why more professionals trust the sound of Pro Tools than with any other DAW. Now you can get even higher fidelity audio with HDX. Because Pro Tools HD is designed and optimized to be part of an integrated hardware/software solution, you can capture audio in pristine clarity with near-zero latency. Even when mixing large, complex projects, you’ll experience uncompromised performance—on a Pro Tools|HDX DSPpowered system or on the host with Pro Tools|HD Native. Solo tracks in PFL (pre-fader listen) or AFL (after-fader listen) mode. Work more efficiently when punching performances with TrackPunch and DestructivePunch. And enhance and speed up editing tasks with Continuous Scrolling, Scrub Trim tool, Replace Clip command, Time Compression and Expansion Edit to Timeline Selection command, field recorder workflows, and more. 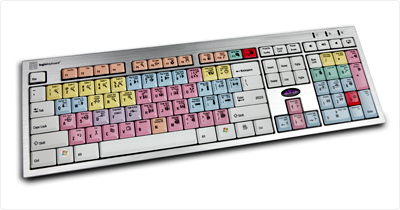 Edit and mix sound for larger, more complex video productions, and display up to 64 video tracks in the timeline. Expand your post capabilities with advanced video features, including multiple video playlists and basic video editing tools. 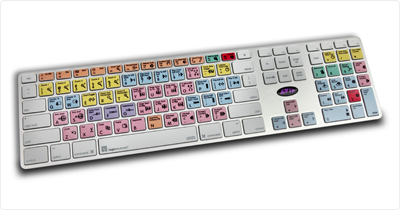 Share audio mixes with Media Composer editors (and vice versa) through AAF. Or integrate directly into the Media Composer workflow with the Video Satellite option, eliminating the need to render effects, transcode video, or copy files. 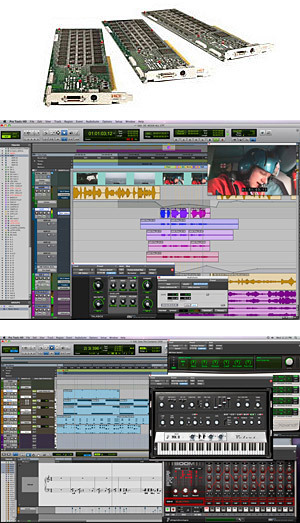 With Pro Tools HD, you can mix in everything from mono up to 7.1 surround sound. Build up your sonic landscape and add movement to your mix with the built-in surround panner. Work with groups of tracks faster and easier with VCA Group mixing. And with advanced automation tools, you can tackle even the largest, most complex mixes with ease. 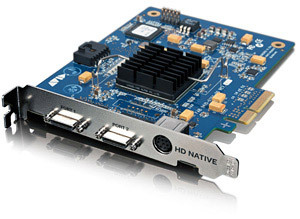 HD Native Thunderbolt has exactly the same features as the HD Native PICe card. 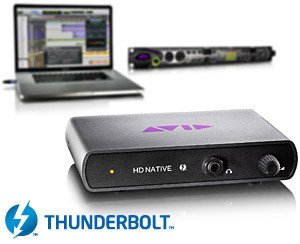 Compared to its sister card, HD Native Thunderbolt offers greater flexibility, bringing HD I/O sound quality and Pro Tools HD software to a laptop. And audiophile quality headphone amp capable of driving even the most demanding headphones. HD Native is a perfect companion to Avid VENUE system, enabling 64 tracks of recording and playback with a small box that fits your backpack. 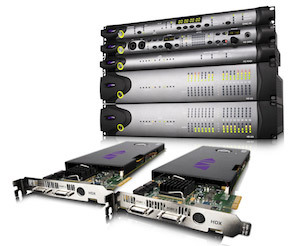 Avid’s flagship audio I/O Pro Tools | MTRX is based on the revolutionary DAD AX32. MTRX delivers incredible sound quality with unparalleled flexibility, making it the ultimate centerpiece of a modern recording or post production studio. With one 2RU device you do more than with a rack full of traditional I/Os and cover DigiLink, Dante, MADI Coax, MADI Optical, AES/EBU, SDI, DSD, and last but not least up to 384kHz analog I/O with pristine remote controllable Mic Pres. MTRX can clock to AES11, Word Clock as well as Blackburst and sports dual PSUs for high-level redundancy. A perfect companion to Avid S6, MTRX also comes with Pro | Mon 2 software pre-installed, enabling complex multichannel monitoring, remote controllable directly from S6 touch screen. In addition to its 1’500 x 1’500 matrix, Pro | Mon also provides a 256 x 32, 32-bit floating point summing mixer, enabling you to sum stems and sources to feed monitor outputs. The modular design of MTRX lets you roll your own dream machine and upgrade its capabilities in the future. Additionally to the 16ch AES/EBU and 64ch BNC coax MADI on board, you can add up to eight of the following cards. Up to six of them can be analog converters for max. 48ch analog in or out. If there ever was a Swiss army knife for highest end professional audio, MTRX is it. Contact us for a demo, this is the future of audio interfaces. While resembling “blue” I/Os on the outside, HD I/O has been completely redesigned on the inside with high-quality electronics with best-in-class A/D and D/A conversion and the lowest possible latency. HD I/O comes in three configurations, so you can choose the interface that best suits your connection needs. 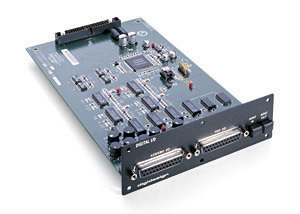 Additionally you can expand your analog or digital I/O by simply installing an HD I/O option card into any empty bay. HD OMNI is an all-in-one interface, designed to completely integrate with Pro Tools HD. You can connect your mics, instruments, line-level gear, and digital devices, and choose how you want to monitor your mix. HD OMNI implements the same state-of-the-art ultra low latency A/D and D/A conversion of the HD I/O. It can be also used as standalone monitoring unit without having Pro Tools running. 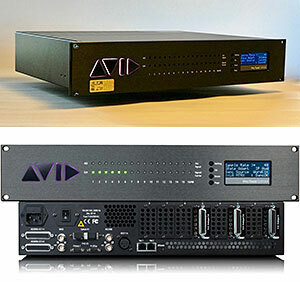 The Avid HD MADI allows Pro Tools|HD workflows to integrate with MADI-equipped devices, including routers and digital mixing consoles. HD MADI offers great connection flexibility, fuss-free use through built-in sample rate conversion, and the ability to send and receive up to 64 channels of audio between your Pro Tools setup and MADI devices up to 2 km away, all with a single rack unit interface. Accommodating the high sample rates supported by Pro Tools|HD with the utmost accuracy, SYNC HD attains near sample-accurate lock to serial timecode (via RS-422), LTC, or bi-phase/tach signals. It incorporates a high-fidelity, low-jitter master Word Clock that supports operations up to 192 kHz as well as standard pull-up/pull-down rates for film and video applications. SYNC HD also features AES/EBU clock I/O, SD and HD video reference in/thru, video program in/out with timecode window inserter, and a host of other features, making it the obvious choice for professional Pro Tools|HD installations in commercial music and post-production facilities. PRE offers a transparent pre-amplification stage designed specifically for the Pro Tools|HD environment. surfaces while retaining all the conventional alphanumeric labels that appear on standard computer keyboards. The keyboard also offers plug-and-play USB connectivity. The Avid HD Native card give you the possibility to use the full capabilities of Pro Tools HD software in a lower-cost native solution. For music and post-production professionals who want the CPU-based best performance possible, Pro Tools Native is the solution as the on-board FPGA chip frees the host from routing etc. housekeeping work thus guaranteeing lowest possible latency on a host based system. Pro Tools HD software offers an unparalleled breadth of options for creating in a professional music or post production environment. Easily import audio and MIDI files and loops for rapid song construction. Take advantage of an unmatched range of unique, non-destructive editing tools for groove creation, dialog replacement, Foley, and more. Choose among a wide-range of instrument and effects plug-ins for creative song development and sound design. Even experiment freely with different arrangements on the fly — all non-destructively. 192 I/O, the flagship of the Pro Tools|HD interface family, is the best-sounding audio interface ever offered from Digidesign, rivaling similar products costing more than twice its price. In addition to support for up to 16 channels of analog and digital input and output, 192 I/O features a wide range of analog and digital I/O options to choose from. To expand the analog I/O capacity of 192 I/O, you can add a 192 AD card, providing 8 more channels of high-definition analog input. The analog I/O capacity of 192 I/O can be expanded by adding the 192 DA card, which gives you 8 additional channels of analog output. 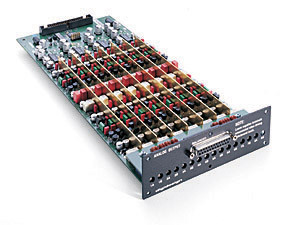 192 I/O can also be outfitted with the 192 Digital card, which adds 8 channels of AES/EBU, TDIF, and ADAT I/O connections. 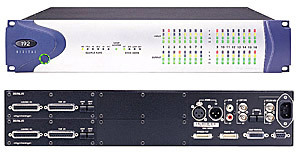 192 I/O can also be outfitted with the 192 Digital card, which adds 8 channels of AES/EBU, TDIF, and ADAT I/O connections. 192 Digital I/O is a high-definition audio interface specifically designed to facilitate digital input from a variety of sources into the Pro Tools|HD environment. It features a wide range of digital I/O options, including up to 16 channels of AES/EBU, TDIF, and ADAT I/O, along with S/PDIF I/O. 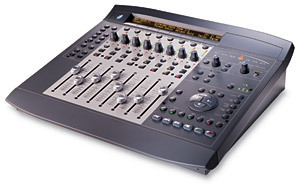 The 96 I/O offers Pro Tools users a high-resolution, multi-channel audio interface with excellent sonic performance. An affordable 16-channel audio interface for Pro Tools|HD, 96 I/O features a wealth of I/O options, including 8 channels of high-definition analog I/O, 8 channels of ADAT optical I/O, 2 channels of AES/EBU and S/PDIF I/O, and Word Clock I/O. 96i enables you to readily introduce output from third-party outboard gear — keyboards, samplers, effects, and other line-level equipment — into your Pro Tools environment. Its 16 analog inputs provide balanced or unbalanced A/D conversion using tip-ring-sleeve (TRS) 1/4″ connectors. 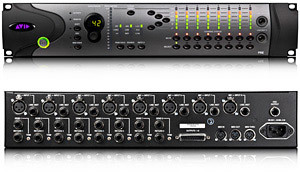 A S/PDIF port capable of 24-bit digital I/O allows you to connect professional DAT recorders, CD players, and other digital recording devices. 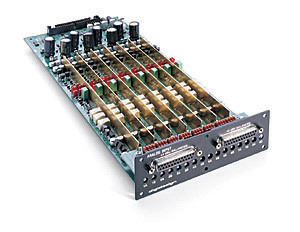 A/D and D/A converters of the same quality as those of the Digidesign 96 I/O ensure that your signal’s fidelity is maintained going into and coming out of Pro Tools. MIDI I/O includes 10 MIDI inputs and outputs for a total of 160 channels. The hardware thru mode allows you to patch any number of inputs to any number of outputs without the need to access your computer. MIDI I/O connects to your computer via a self-powered USB connection and includes support for MIDI Time-Stamping for superb timing accuracy and precision. The SYNC I/O the most consistent and dependable synchronization solution for Pro Tools|HD installations in commercial music and post production facilities. Command|8 puts integrated, tactile manipulation of Pro Tools TDM or LE systems running on Windows XP or Mac OS X at your fingertips more affordably than ever before. While there are several compact control surface options from third-party manufacturers compatible with Pro Tools, only Command|8 was made by Avid and Focusrite specifically for Pro Tools. As a result, Command|8 provides a great deal more sophisticated control with Pro Tools software, and has been tested and qualified specifically for Pro Tools.